The word "kiwi" often brings to mind the image of something small, brown, fuzzy, and found in the produce section of your local supermarket. But the kiwi is not a fruit—that's kiwifruit, which is native to eastern Asia! About the size of a chicken, the kiwi is a small, flightless, and nearly wingless bird found only in New Zealand. Like its larger cousins the cassowary, emu, ostrich, and rhea, the kiwi is classified as a ratite. Most birds have a special ridge on their sternum, called a keel, where flight muscles attach, but ratites don't need keels because they don't fly. Scientists thought for many years that the kiwi's closest relative was another ratite called a moa, an extinct bird that was also native to New Zealand. However, recent genetic studies have shown that Africa's ostrich is related to the moa while the kiwi is more closely related to Madagascar's extinct elephant bird. Regardless of what it’s related to, this odd-looking bird resembles a large, hairy pear! Its wings are only about 1 inch (3 centimeters) long and are useless, completely hidden under the feathers. 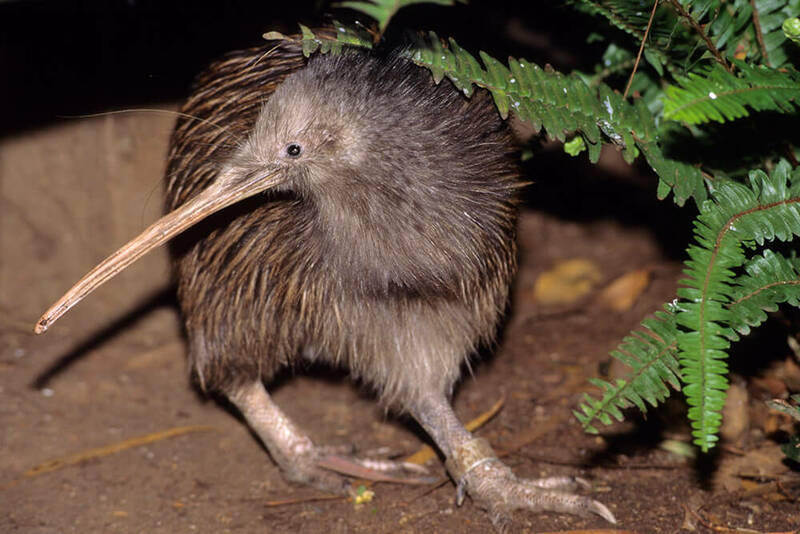 The kiwi has no tail but does have very strong, muscular legs, which make up about a third of the bird’s total body weight, that are used for running and fighting. Four toes (other ratites have only two or three) on each thick foot allow the flightless bird to pad silently through the forest in search of food. Despite its small size and awkward appearance, the kiwi can outrun a human and is quite wary. Looking quite different from any other bird, the kiwi has many body parts that make it seem more like a mammal. While most birds have thin skin and hollow bones to make them lighter for flying, the kiwi's skin is a bit thicker and tough, and its bones are heavy and filled with marrow. Its wings have a cat-like claw on the tip, like some bats’ wings have, but it is nonfunctional. The kiwi digs burrows instead of building a nest. Its feathers are long, loose, and hair-like, and it has modified feathers that serve as whiskers on its face and around the base of its beak. The kiwi also has a relatively low body temperature (100 degrees Fahrenheit or 38 degrees Celsius) that is much more like a mammal than a bird. The kiwi lives in forested areas of New Zealand that tend to be very steep and wet, surrounded by shrubs and trees found nowhere else on Earth. Since it is not able to fly up into trees to nest, rest, or escape from danger, the kiwi makes its home in burrows in the ground of its swampy forest or grassland habitat. The bird digs multiple burrows within its territory, using strong toes and claws. Nest burrows, dug early in the season, become overgrown at the entrance to provide great camouflage by the time the female is ready to lay her eggs. Most birds sleep at night, and it has long been thought that the kiwi is nocturnal, since it is rarely seen during the day. But researchers studying the bird on New Zealand's Stewart Island have seen them out and about during the day. Still, the kiwi usually rests in deep underground burrows or hollow logs during the day, and as night begins to fall, it slowly pokes its bill out to sniff the air. If the coast is clear, the bird cautiously emerges to begin a nightly routine of gorging on worms and other invertebrates. Kiwis evolved sharing their habitat with another bird, the weka, that eats their eggs, so they had to get “sneaky” in hiding their burrows. However, their casual “sleeping burrow” has a noticeable dirt arrow pointing right to it, as the kiwis fling the dirt behind them while making the opening! Because they did not evolve with any mammal predators around, kiwis lack the appropriate anti-mammal predatory response; kiwi chicks are vulnerable to nonnative predators like domestic cats and dogs, as well as stoats, weasels, ferrets, and rats. Sadly, this species suffers from a 95-pecent chick mortality rate! The kiwi is the only bird in the world that has nostrils at the tip of its bill. It also has a highly developed sense of smell. Using only scent to find food and sensory pads at the tip of the bill to catch its food, the kiwi lives on grubs, worms, bugs, berries, and seeds. If dirt gets sniffed up in it nostrils, the kiwi can sneeze it out! It can also use its sturdy, powerful feet to kick apart rotting logs to find beetles to eat. Foraging from dusk to dawn, these birds can be heard snuffling around in their territory; if alarmed, they run off and then stick their bills into the air, sniffing to see if it's safe to return. Their ears are large, giving them a very good sense of hearing. They have been seen tipping their head toward a sound to listen more clearly, much like humans do. A kiwi is very protective of its own territory—it doesn’t want other kiwis taking all the good food and burrows it worked so hard to make. So, the kiwi patrols its area every night, leaving smelly droppings to mark boundaries to keep other kiwis away—a very unbird-like behavior. To keep track of each other in the dark, kiwis can shriek loudly, a half scream, half whistle that also serves to scare others away. This cry sounds like “kee-wee, kee-wee,” which is how the bird got its name. The kiwi can also grunt, snort, and hiss when angry. Kiwi pairs use gentle grunts and snuffles with each other and their chicks, and males purr during mating. Pairs do fight, and the larger female may kick the male away if she is not in the mood for his company. If another kiwi invades a pair’s territory, a kicking fight ensues, and kiwis have been known to fight to the death, although this is rare in the wild. An adult male and female kiwi typically pair for life, but a female may choose a new male if a more desirable one wanders by. The male doesn't have beautiful songs or fancy feathers to attract a female. Instead, he follows one around constantly while grunting. If she's not interested, the female might wander off or try to scare him away. Breeding season is late winter to early summer. Nests might be in hollow logs or in underground burrows dug by the male. The female kiwi lays up to six eggs every year. Kiwi eggs are smooth and white, off-white, or pale green in color. They are also huge in comparison to the mother: one egg might reach up to 20 percent of her weight; that would be like a 120-pound (54 kilograms) human female giving birth to a 24-pound (11 kilograms) baby! Compared to the relative weights of other birds and their eggs, the female kiwi should weigh about 31 pounds (14 kilograms) rather than its typical weight of 2 to 8 pounds (0.9 to 3.6 kilograms). Kiwi eggs contain almost twice as much yolk as most birds their size and have natural antibacterial and antifungal properties. This is important because the kiwi’s damp, underground burrows are fertile breeding grounds for bacteria and fungus. How did the kiwi evolve to create such a huge egg? Probably due to an abundant food source providing plenty of raw material for egg production, the kiwi’s loss of flight, eliminating the weight limit on the egg, and the lack of predatory pressure on a bird that historically had no native New Zealand predators. The large egg results in a long incubation period. As ancestral kiwis decreased in size, the egg stayed the same size, allowing for a more developed (precocial) chick needing less parental care. After the egg is laid, the male takes over parenting duties. He incubates the egg and maintains the nest for nearly 75 to 85 days, but if the female returns to lay another egg, the male has to sit on the clutch that much longer. Unlike most bird parents, kiwis do not turn their eggs. Lacking an egg tooth, the chick must kick its way out of the shell. It hatches wearing shaggy adult feathers and looking like a miniature version of its parents. No ugly baby phase for these birds! The youngster is not fed by the adults but gets its nourishment from a large reserve of yolk in its abdomen. The chick stays in the nest for its first few days, gaining strength. The young kiwi then leaves the burrow and, accompanied by Dad, begins the search for food. It stays with the male up to 20 days and may stick around in the adults' territory for months or even years. It was long thought that the kiwi mates for life, but as researchers come to know individuals during research in the wild, it has become clear that the kiwi “divorce rate” was quite high, with birds changing mates every couple of years, in areas where kiwis were abundant. 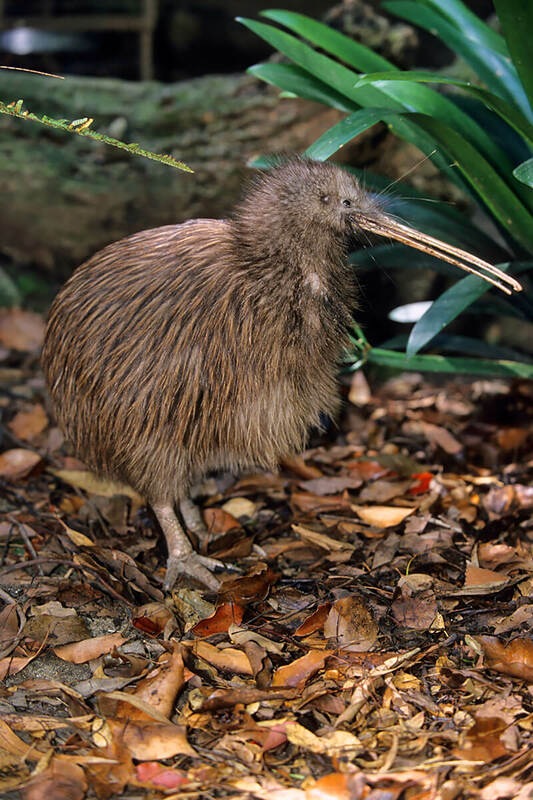 The San Diego Zoo’s first kiwi arrived from the Auckland Zoo in New Zealand in December 1954, the only kiwi at that time to live in the Western Hemisphere. That zoo’s director had visited our zoo and determined, after looking it over carefully, that a kiwi would do well here. The bird was named Belle, after our director at that time, Belle Benchley. Ornithologists and scientists came from around the U.S. just to view our kiwi. 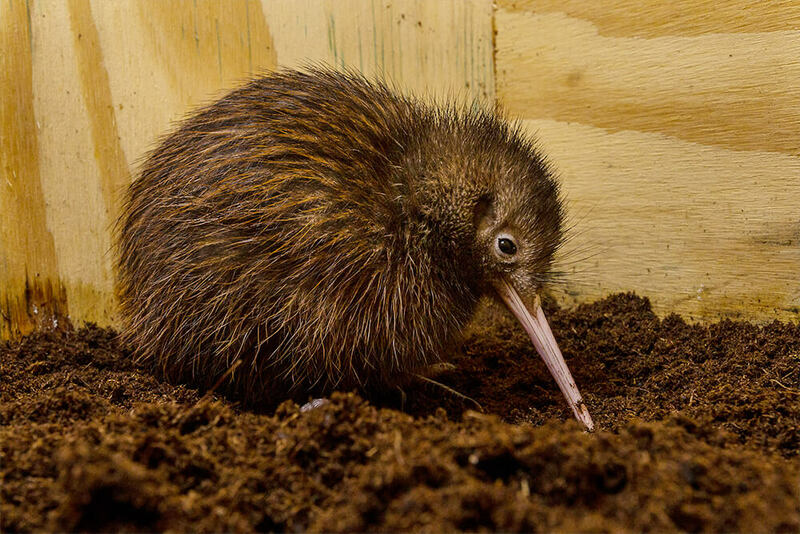 The San Diego Chapter of The Kiwis (formerly American Airlines flight attendants) donated funds for the construction of a kiwi enclosure. A few years later, Belle the kiwi turned out to be a male and was renamed Benjamin. He was introduced to his potential mate, Nancy, in 1967, a gift from the Wellington Zoo, the Wellington City Council, and the Government Wildlife Division of New Zealand. Nancy arrived via a well-advertised Kiwi Flight on Air New Zealand. Both Benjamin and Nancy died in 1968. In 1969, a nocturnal exhibit was built for a new pair of kiwis, given to the City of San Diego on its 200th anniversary by New Zealand Wildlife Service. The home for Toa and Uha, whose names are Maori for “male” and “female,” had a unique feature at the time: it was dimly lit by a blue light during the day so Zoo guests could see them most active, and brightly lit at night, to encourage the birds to sleep. Toa died in 1972, but a new mate for Uha, named Toa II, arrived on loan from the National Zoo in Washington, D.C. in 1973. Yet, like Belle/Benjamin, Uha had difficulty living up to “her” name, and the discovery that both birds were male did little for our hoped-for kiwi breeding program. It was not until 1979 that a breeding program was started here in earnest, with kiwis from the San Diego Zoo, the National Zoo, which had hatched a kiwi in 1975, and the Auckland Zoo. However, utilizing both indoor and outdoor exhibits and rotating the five kiwis in the breeding program still produced nothing but 16 infertile eggs in 4 years. In 1983, the right combination was found at last, and our first kiwi hatched. Sadly, the chick died from a bacterial infection three weeks later. A second chick hatched in 1986. Since then, we’ve had much better success with kiwi hatchings. Currently, there are four brown kiwis at the Zoo, but they live in an off-exhibit area as part of our conservation breeding program for this species. The kiwi existed for millions of years with only one natural predator—the now-extinct laughing owl—and no threats of any kind. When the Maori people established themselves in New Zealand in the 1300s, they used kiwi feathers to adorn cloaks worn by their chiefs and used the birds as food, hunting them at night by imitating kiwi calls. But in the late 1800s, settlers moved into kiwi territory, bringing dogs, cats, ferrets, stoats, and rats that ate kiwi eggs or the birds themselves. The settlers prized kiwi feathers, too—for trout flies! Kiwi leg bones were popular as well for making pipe stems. New Zealand passed a law in 1908 prohibiting the hunting, capture, or killing of kiwis, but the $100 penalty did little to control the situation, and in 1921 the kiwi was declared an “absolutely protected bird.” Its popularity grew, and the kiwi was adopted as New Zealand’s national emblem. Coins, postage stamps, fighting troops, and shoe polish all carry the name or image of the unique bird. New Zealanders even accepted the nickname “kiwis” given them by their allies during World War II. Today, 80 percent of kiwi habitat has been destroyed, and the birds continue to fall prey to dogs, weasels, cats, ferrets, pigs, people, cattle guards, cars, swimming pools, and possum traps. Still, the birds are highly adaptive and have been seen in New Zealand cow pastures and plantations. Every year, 95 percent of all kiwi chicks are killed before they reach the age of 6 months, and every 2 years the kiwi population decreases by about 10 percent. A few years ago, New Zealand began a kiwi recovery program. People living near kiwi areas have learned to keep their dogs leashed and to slow their cars when they see a kiwi caution sign by the road. Operation Nest Egg collects eggs from the wild and raises the chicks until they are large enough to defend themselves against predators following release into the wild. In 2009, San Diego Zoo Global formed collaborations with local ranchers on a private island off the coast of western New Zealand, Massey University, in-country scientists, and the native Maori people to delve into the ecology of the brown kiwi, which has been in decline for decades. Learning about the reproductive ecology of this bird is the only way to ensure that its populations will survive and thrive. The island is secluded, protected habitat with a high density of kiwis. Techniques were developed in our labs to identify individual kiwis by their DNA and, and ultrasound procedures were used to monitor growth of ovarian follicles to estimate egg-laying time. This newfound knowledge was then successfully applied to birds on the island. Eggs laid by zoo kiwis tend to be much smaller and have a much lower fertility rate than their wild counterparts. By monitoring egg development in the wild, we hope to discover ways to improve fertility and survival of eggs at our facilities. Important data can also be gleaned from radio-tracking devices on the birds. After months of fieldwork, 47 adult kiwis on the island now have a radio transmitter attached to a leg, and 41 kiwi nests were documented, allowing us to explore the importance of habitat and behavior on the nesting success of this rare and reclusive species. The birds are identified with transponder tags, such as those used to microchip domestic pets. The radio transmitters reveal a great deal about where the birds go and how far they travel for food. One area of study is mate choice and how long kiwis stay together. Ongoing research will compare hormone levels in wild birds to those in managed care and also observe chick dispersal patterns for this long-lived bird. A few fascinating facts have emerged from our efforts so far, such as finding three males incubating a single egg! A female kiwi can lay 100 eggs in her lifetime. The kiwi has the lowest body temperature of any bird. The kiwi is thought to be the world's most ancient bird, evolving over 30 million years ago. About the same size as a chicken, a kiwi's eggs are almost as big as those of the emu and are one of the largest in proportion to body size of any bird in the world.